Jon fells a tree on his property with his father. 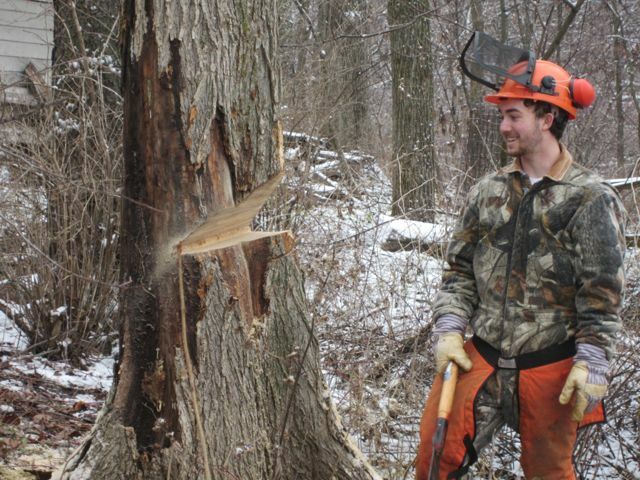 Jon Fox currently studies forestry at the University of Wisconsin-Stevens Point. His interest in forestry has deep roots, having grown up on 16 acres of woodlands in Dane county. His parents bought the property in the late 1980s, and have been caring for its woodlands, since. Jon has always been engaged with his family’s woodlands, working alongside his dad to remove invasive species and manage their property for wildlife and hunting. Studying forestry in school, however, has expanded Jon’s knowledge and granted him a whole new perspective on the field. Jon notes that he has always enjoyed the woods, but since attending school, has come to realize just how diverse and special his family’s woodlands are compared to some of the northern pine stands. The property is home to large oaks mingled with evergreens left from their family’s old Christmas tree farm. Eagerly, Jon lists the other species on their land, including hazelnut, aspen, and mountain ash, that he hadn’t noticed before going to school. With a mutual love for the land, it was only natural for Jon to follow in his father’s footsteps and join WWOA. He remembers his dad being involved with the Blackhawk chapter when Jon was a child. As Jon got older, his dad urged him to get his own membership, gifting him his first to further expose him to the organization. Jon has been a member for two years now, and after moving to Stevens Point, has reached out and volunteered in the WWOA office. Jon continues, “As a young person entering the forestry field, it’s a good way to connect with people and find new resources. Plus, it’s a great organization that I don’t want to see go away.” He enjoys listening to other members talk about their land and learning about what they’ve done in their woodlands and looks forward to being more involved with meetings and field days in the future. He believes he can learn a lot about his own land from others’ experiences on theirs. A unique management experience Jon shared regarding his family’s land was tackling a patch of black locust trees. The wood from the trees are known to make strong posts because of their natural rot resistance and density, and so, when Jon’s family removed some of the trees, they shared the wood with a friend who was building a tall trellis to grow hops on. Jon was glad to help the forest and a friend. Jon is excited to continue learning about the forest and what it means to be a woodland owner. As his family’s forest matures, he looks forward to seeing what will follow the long lived oaks that currently stand at turn over stage. Because their woodlands are smaller, Jon feels a strong, familiar bond with the entire property. One of Jon’s favorite moments on his family’s woodlands go back to his family’s name. He smiles and explains that the area foxes have found a fondness for their forest. He loves to see mother foxes carry a mouthful of their kits around. Jon says it’s pretty special to share the woodlands with the critters that share his name.